1) The Moravians Wachovia Tract (1753 - almost 99,000 acres), as much as 175+ acres later fell under the Brookberry Farm boundaries (Reid tract, eastern parts of Hartley and McCants tracts). 2) John Hauser (3 Apr 1780 - 600 acres), 235+ acres became Brookberry (Tise, Shoaf, Peacock, Webster, and Shutt tracts, including the Bowman Gray mansion). This John Hauser was the son of Michael Hauser, Sr., and therefore a grandson of Martin Hauser, Sr.
3) Henry Holder (3 Apr 1780 - 200 acres), 100+ acres became Brookberry (Bingham and Brandon tracts, plus the western part of McCants and eastern part of Beck tracts). 4) Michael Carver (13 Oct 1783 - 600 acres), as much as 75+ acres became Brookberry (Boggs and Vogler tracts, southern half of Ketner tracts). 5) James Gordon (3 Nov 1784 - 350 acres), as much as 100+ acres became Brookberry (Northern half of Ketner tracts and western half of Beck tract). Brookberry Farm at it's height included as much as 900+ acres. At least 800 of that if not all of it can be accounted for in the above 5 original land grants. I am still working on the exact positions of some of these original grants, thus the reason for not being able to be more conclusive on the acreage of each grant that falls under the Brookberry Farm boundaries. That will come in time, however. The main 200 acre tract in the center of the farm (includes the Gray mansion, and the southern half of the developed area, and everything south from there), can definitively be traced back to an original land grant from the state of NC to John Hauser. I confirmed this conclusively on 22 Jan 2010. John Hauser's grant (still need more details on it, but this much I do know) contained about 600 acres. After his death in the late 1700's his land was devised to his heirs, who in turn sold the 3 tracts of 200 acres each to various parties. The northern most 200 acre tract was sold to Matthew Brooks (possibly "Jr") in 1799 (Stokes Deed Book 3 Page 227). This includes the land from Hundley Rd at the back side of Meadowlark Downs, running north behind Meadowlark Downs to Brookberry Farm Rd. From there it runs west all the way to the Gray mansion and just a little west of that (but not all the way to Ketner Rd, however). Then it runs south to a point even with Hundley Rd and then back east to the backside of Meadowlark Downs. The above tract contained 200 (actually about 204.75) acres. Also in 1799, another 200 acre tract on the SOUTH side of Brooks' tract was sold to Samuel Vest (Stokes Deed Book 3 Page 202). Beauchamp Rd runs into the heart of that tract. The southern line of this tract, however, ran a little north of Country Club Rd. Ten years prior to this, in 1789, the other 200 acre tract was sold to Christian Hauser (Stokes Deed Book 1 Page 52). This tract is south of Vest's tract and crossed over Country Club Rd and encompassed Lewisville Motor Company, etc. As for Matthew Brooks, he sold his 200 acres to Nathaniel Lash (probably his brother-in-law) on 19 Feb 1802 (Stokes Deed Book 4 Page 149). The cemetery where Nathaniel Lash, and his wife Aggie Brooks Lash, are buried is located in the NW section of this very same tract of land, originally owned by John Hauser. Debbie... you live on this tract of land, by the way. Forsyth County NC was formed in 1849 from the southern half of Stokes. As early as the 1740s it was part of Anson Co, then Rowan, then Surry, Stokes and finally Forsyth. The history of what is now northern Forsyth Co, particularly north and northwest Forsyth, has become a hobby of mine in recent years. The following are some excellent resources for researching the NW and northern parts of Forsyth Co.
Judy Cardwell has some excellent documentation on her website of the old wagon roads and deeds plotted (and overlaid) on modern maps. Two pages of particular interest to me are her pages on Charles Vest Sr and Some Early Wagon Roads of Northwestern Forsyth County. Judy has put a tremendous amount of research into her work and has been super gracious in sharing her research. Another excellent resource is Kay Haden's site concerning Gideon and Hezekiah Wright. Kay has tons of research notes available, especially on the pages under the link "Descendants of ??? Wright" (the father of Gideon and Hezekiah). A wonderful book by Beverly Hamel on the history of Bethania covers a myriad of historical issues from the mid 1700's to date, using the Moravian diaries, and many other resources. 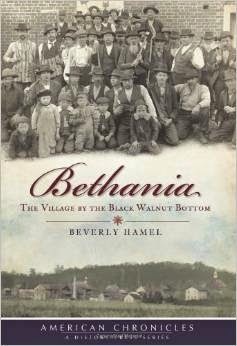 Her book is entitled Bethania: The Village by the Black Walnut Bottom, and is available at Amazon.com (follow the link). Two excellent resources for researching deeds are the Forsyth Co Register of Deeds and the Stokes Co Register of Deeds. Both have their deeds imaged and available online. Another good map is of the old Wachovia Tract, placed in modern Forsyth County. Another good map (thanks to Bev Hamel for pointing it out to me) is the 1770 Collet Map of NC. This is stored online and you can zoom in and out. Surry County NC Wills 1771-1827 by Jo White Linn is a good resource to have. I'm sure there are many more online resources, but I'll start with these and add more as they become evident. Been a busy holiday season plus work has picked up the last week or so. I'm still here and kickin', just behind on some of my research endeavors. I should be getting back to documenting my research here soon. I've been working on some book ideas and getting ready to start on phase 2 of the Brookberry Farm / Stewarts Creek deed mapping project.